"By Elbereth and Lúthien the Fair," said Frodo with a last effort, lifting his sword, "you shall have neither the Ring nor me!" 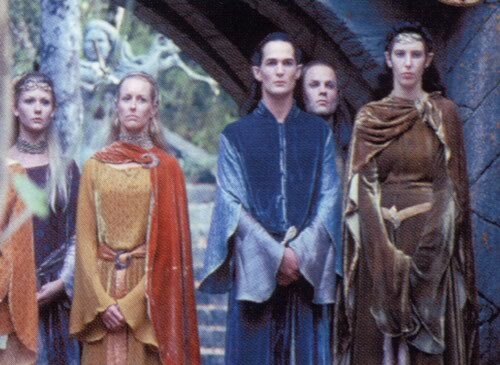 One of the distinguishing features of the Elves is their stately posture. This article will explain some exercises, which you can use to help give you this Elven look. Using these simple techniques not only will you look better, you’ll feel better too! As always, please consult a physician before beginning any new exercise program. Begin by breathing deeply and concentrating on the movement of your breath as it enters your body moving downward, pausing then upwards and out. Once you are relaxed slowly move to a standing position from which we will begin our first exercise. No, this is not a WWF move. Despite its name it is a wonderful way to calm nerves and improve posture. Begin by standing up straight with your arms lowered at your sides. Slowly lift your right arm, feeling it move through space, until it is in a vertical position above your head. This need not be a slow movement, but you should be aware of what your body is doing at all times. Keeping your right arm loosely in place repeat with the left arm. Both arms should now be lifted above the head. Now stretch as though trying to reach the ceiling. Remember to take deep cleansing breaths. Now release your fingers, letting them drop, followed by the wrists, then elbows. Finally, return your arms to the position they were in at the beginning of the exercise. Now slowly lower your head to your chest as though a magnet in your forehead is pulling it towards the floor. Lower your back vertebrae by vertebrae until you are touching the floor. Squat down with your hands between your knees and your palms placed upward. Breath slowly and deeply. Shake your head from side to side to release any tension held in the neck. When you are ready, slowly return to the standing position, rolling the spine up vertebrae by vertebrae. In a sitting or kneeling position place your hands behind your back, interlocking your fingers. Stretch them as far behind you as is comfortable. Arch your back while looking upwards. Hold, remembering to breathe. Sit with your back against a straight, molding-free surface such as a door. Make sure your shoulders are back and your spine is aligned with your head and shoulders. I like to sit like this while watching television. Start with fifteen minute intervals and work your way up to thirty minutes as your muscles become accustomed to this improved way of sitting. I hope you find these exercises fun and helpful in your quest to achieve Elvish beauty. Nice exercises. Wouldn’t overwhelm anyone’s body if done properly and as described 😉 tested it myself. Tested it too, like it really, it also helps when your back hurts often when working.